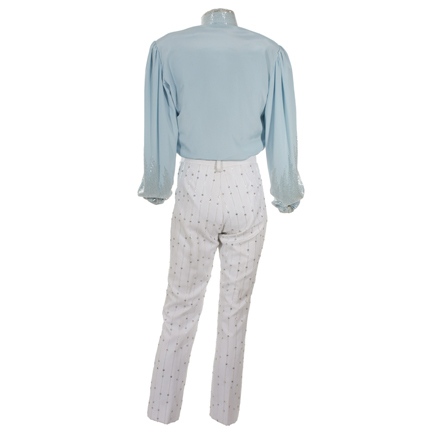 This light blue beaded shirt and white pants with rhinestones were worn by legendary performer Michael Jackson on stage during the 1984 “Victory Tour”, which was the largest and final North American concert tour ever performed by The Jacksons and set a new record for highest grossing concert tour at that time. The shirt was worn with multiple styles of pants during the tour. The pair of pants included with this outfit was worn with the shirt on opening night of the Dodger Stadium performances in Los Angeles, California on November 30, 1984. 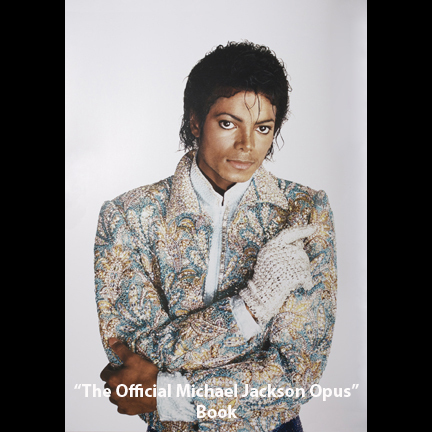 Mr. Jackson also appeared wearing the shirt in numerous photographs used to promote the Victory Tour. A majority of the print materials for the tour showcase Jackson wearing the shirt with a sequin and rhinestone encrusted gold and blue floral patterned jacket. This jacket is currently on display at the Grammy Museum in Los Angeles as part of their special exhibit, “Michael Jackson: A Musical Legacy”. 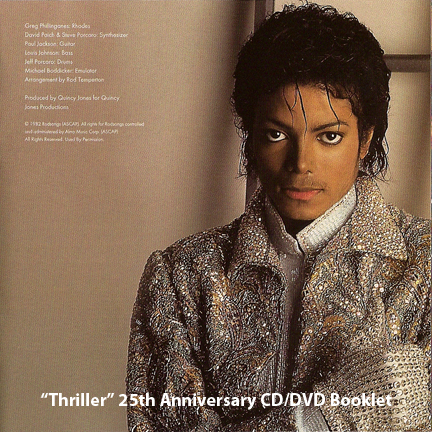 Versions of the original photos have been used liberally in promotional materials ever since, appearing twice in the Official Michael Jackson Opus Book, multiple times in the hardcover photo journal of the concert series: “Michael Jackson: The Victory Tour”, inside the booklet for the 25th Anniversary “Thriller” CD/DVD, on boxes for official merchandise, on collectible bills, as well as featured in the program for Jackson’s memorial service in 2009. 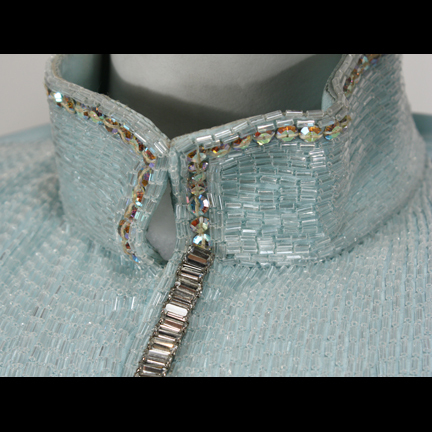 The long sleeved shirt with small stand collar is constructed of light blue silky polyester and is heavily embellished with clear bugle beads on the collar and front in a cascade pattern. The full sleeves are gathered at the shoulder and wrist, and are embellished from the cuff to the elbow with the same beading pattern. The stand collar is edged with large round rhinestones, and the front hidden-snap closure is edged with clear baguette rhinestones. The shirt attaches to the pants with bands of Velcro around the waist and also has Velcro fastenings at the cuffs. The Velcro and snaps were used to both keep the singer’s shirt tucked in when dancing and to aid in quick changes between costumes during the live performances. 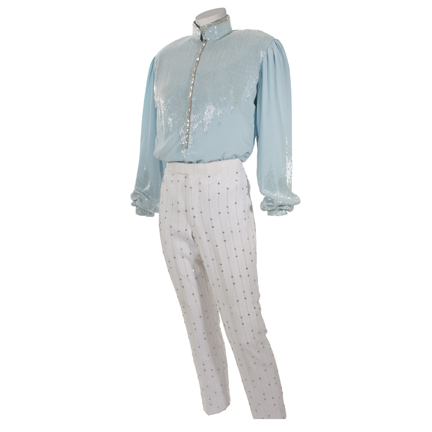 The tab front pants are made of thick stretch polyester, and are embellished with stripes of clear bugle beads dotted with round rhinestones. The inner waistband has strips of Velcro sewn in to attach the shirt to the pants. 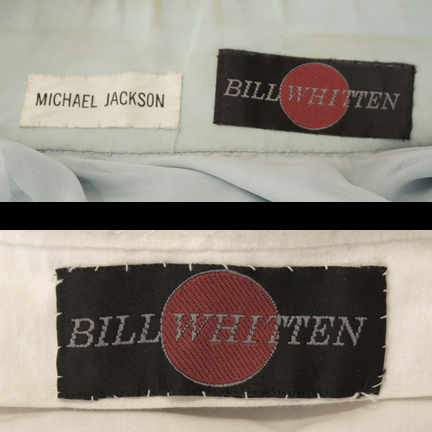 Both pieces have the original Bill Whitten labels, and the shirt has an additional label with “MICHAEL JACKSON” printed in black ink sewn inside the collar. 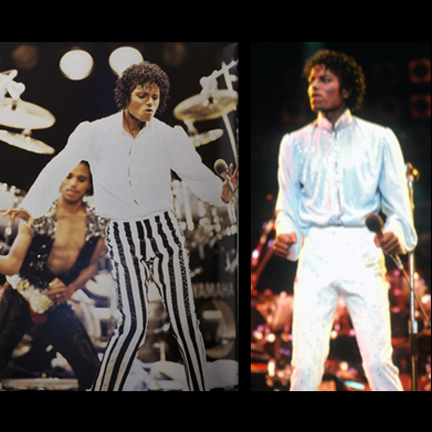 Both the shirt and pants were custom tailored for Mr. Jackson for his use on stage by costume designer Bill Whitten. Whitten designed much of Jackson’s show clothing from the Jackson 5 era through the “Bad” Tour. Along with designer Ted Shell, Whitten assisted in creating some of Jackson’s signature looks, including the iconic “one white glove”. 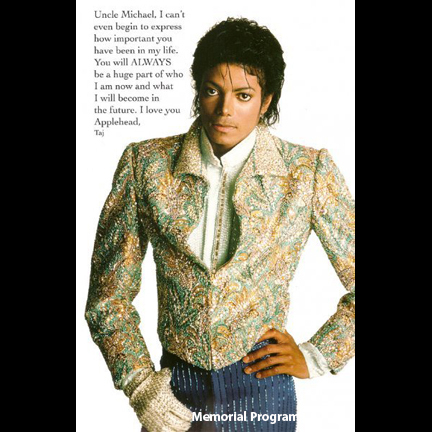 This stage worn outfit is accompanied by copies of “Michael Jackson: The Victory Tour”, the “Thriller” CD/DVD, the memorial program and a collectible “million dollar bill” with a picture of Jackson in the shirt, and will make an impressive addition to any collection of high profile music memorabilia. Presented by The Golden Closet, your premier source for screen used wardrobe, props, and music entertainment memorabilia. Photos and descriptions are the sole property of The Golden Closet. Please note all images appearing here are the property of their respective owners and are utilized strictly for authentication and reference purposes. .